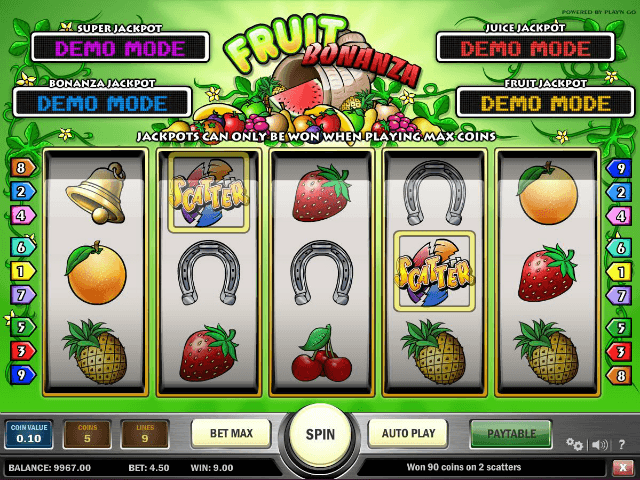 Old-school charm and a nostalgic fruit-based theme are the order of the day in Play'n GO’s Fruit Bonanza slot. Four progressive jackpots help make this five-reel, nine-payline title one to consider for your all-important five a day! 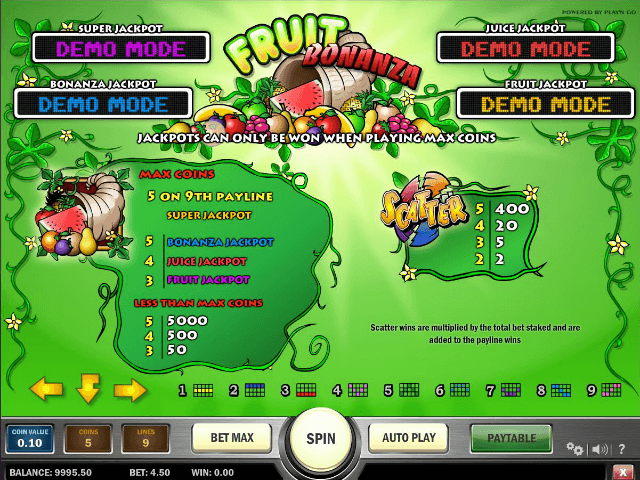 Play Fruit Bonanza Slot Demo for Free! 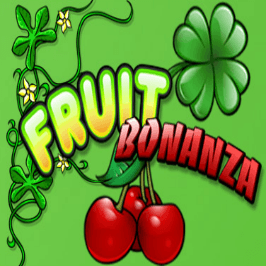 Play Fruit Bonanza for Real Money! 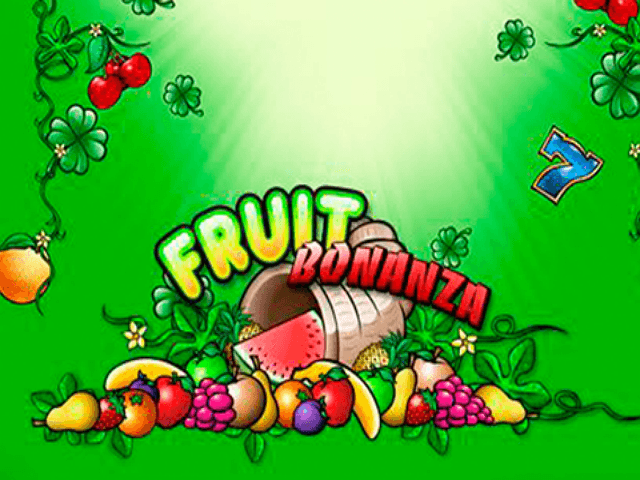 Whilst the Fruit Bonanza slot machine offers little in the way of cutting-edge graphics, its simple visuals do a grand job of replicating the sensation of playing a mechanical ‘fruity’ from way back when. Take the reels, for example. Each one curves away at the top, thereby making you feel like you’re standing in front of a 1980s bandit. The old-style sound effects (particularly the click-clunks when the reels stop) are pretty evocative too. A retro green backdrop (intentionally redolent of an 80s avocado bathroom, maybe?) rounds off the time-travel effect perfectly. The slightly irritating plinky-plonky music is the one slight downer here, but this plays only when the reels are spinning. As you might expect, the Fruit Bonanza slot is not an overly convoluted beast to master. With a fixed coin value of 10p, you can choose the number of coins and paylines manually. There’s also a max bet option that lets you select all nine lines and stake the maximum five coins automatically. If you get bored hitting the spin button repeatedly, then you can use the auto play feature to trigger as many as 50 continuous spins. All wins are multiplied by the line stake and paid out left to right. The exception here is the scatter, which pays either way and is multiplied by the total bet. All of the icons used in the Fruit Bonanza slot game are suitably traditional. Yep, we’re talking pineapples, strawberries, oranges and cherries, along with those venerated sevens, bells, horseshoes and four-leaf clovers. The scatter is an odd-looking, Trivial Pursuit-type mash-up (another deliberate '80s reference perhaps?) while the bonus jackpot avatar is a decadent cornucopia of fruit spilling out of a giant shell. There are no wild symbols in Fruit Bonanza, nor any break-out features. However, there are four progressive jackpots. It’s important to note that you’ll need to play with the maximum number of coins (five per line) to be in with a chance of winning any of the jackpots. Play with smaller coins and you’ll win smaller fixed prizes instead. Fruit Bonanza ticks plenty of boxes, especially in the old-school charm and big jackpot stakes. However, there’s no doubting it suffers a little from not having any breakout bonuses or extra wilds. Enjoyable certainly, but some players might find it's not the freshest fruit title in the basket. Share this Fruit Bonanza Review today! 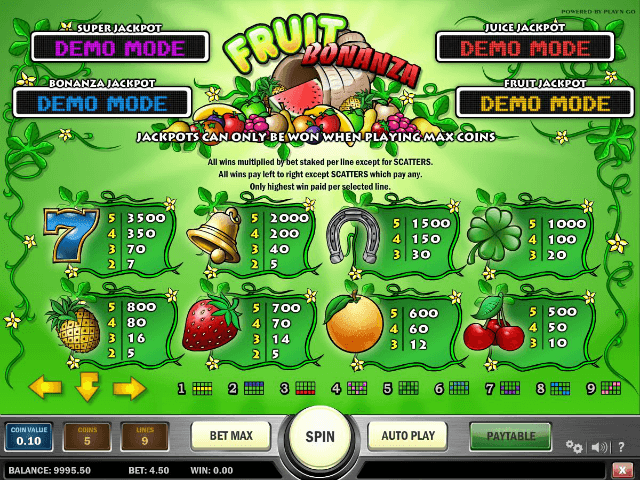 If you like Fruit Bonanza, you'll love these slot titles too!